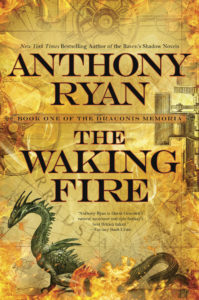 Anthony Ryan has been on my wishlist for a long time, so I was excited to receive a copy of The Waking Fire from Ace recently. I’ve been reading a lot of books about dragons recently (Within the Sanctuary of Wings, and The Summer Dragon by Todd Lockwood, which I still need to review), so I wasn’t sure I wanted to read this one just yet, but I succumbed to the back cover blurb. We follow three protagonists – Lizanne, a covert agent for the Ironship company, Hilemore, a naval officer serving on a cutting-edge new ship, and Clay, a petty criminal recruited by Lizanne’s company for a dangerous expedition. Drake blood, which grants “Blood-blessed” humans special powers, has been dwindling in potency rapidly. To avoid a disastrous economic collapse, the Ironship company is organizing an expedition into the interior of the colonized Arradisian continent to find a fabled new variety of drake. This new White drake isn’t just a simple animal, though, and waking it up proves to be dangerous. There’s a lot going on this book, all three protagonists have pretty different stories, and I don’t think my summary covered it all. Clay is on a standard fantasy quest, Lizanne’s plot is all about espionage and war , and Hilemore seems like he’s straight out of a more traditional military fantasy. All three of them tie together to tell a larger story about a rational and ordered world that’s suddenly going crazy. The world really pulled me in, there’s a bunch of corporations pursuing profit, a simple but versatile magic system, an ambitious empire, cunning pirates, fearsome warriors, and lots of cool dragons. The action scenes were particularly well-done, I could almost see the movie in my head, and I usually just glaze over those kinds of scenes in books. I did have a couple of issues with the book, mainly with the characters. Sometimes I felt like they just did stuff, and I didn’t have any insight into why they were making the decisions they did. It was never bad enough to take me out of the story, but unlike more character driven books, I can’t really describe the characters’ personalities, just their actions. The book also wasn’t as tight as it could have been – Hilemore’s story didn’t tie into Lizanne and Clay’s until the last minute, and I’m still not sure what the significance of his experiences is to the larger story. I also hope the initial premise of drake blood losing potency will be explored in future books, it ended up being overshadowed by larger events. I feel like I’ve read a lot of the great fantasy authors writing today, so I’m always excited to discover someone new, and Anthony Ryan seems like he could definitely be one of them. I’m glad I only have a little over a month until The Legion of Flame comes out, and I’ve also ordered Blood Song, the first book of the author’s previous trilogy, to help me wait.